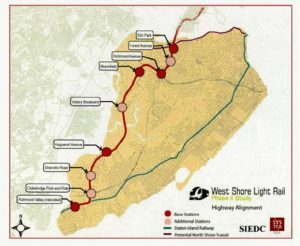 As Silive.com reports, the MTA has funded a study to determine the viability and impact of a proposed West Shore Light Rail System. A cause vigorously championed by the Staten Island Economic Development Council for many years, may at this point, have the most politically favorable environment to actually get off the ground should the study’s conclusions prove feasible. With Staten Island’s S89 bus line already crossing the Bayonne Bridge, and the opening of the new ferry lines connecting south Brooklyn to Manhattan, commuter friendly transportation infrastructure projects seem to be, at least on the surface, a priority for New York City. The West Shore Light Railway as proposed would connect with the existing Staten Island Railroad at the area around the current Richmond Valley Station at Richmond Valley Road and Amboy Road. From there it would proceed North to the west of the of the West Shore Expressway and Korean War Veterans Junction, with stops at the Bricktown Shopping Center in Charleston, Huguenot Avenue & Arthur Kill Road, Victory Boulevard. 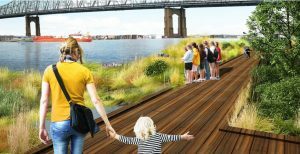 At a proposed stop in Bloomfield’s Staten Island Industrial Park, the railway would proceed east with a station at Richmond Avenue’s intersection with the Staten Island Expressway, then turn Northward and run along the Dr. Martin Luther King Jr Expressway across the Bayonne Bridge to connect with New Jersey Transit’s Hudson-Bergen Light Rail Line. From there commuters would be able to connect to a PATH train or Hudson River ferries to bring them over to Manhattan. The obvious Manhattan bound commuter benefits are plain to see. The possibility of avoiding the dreaded Lincoln Tunnel via express buses, the Staten Island Expressway or the 4,5,6 subway lines (if taking the ferry) during rush hour would be a sigh of relief for many. The less obvious, however no less significant benefit, would be far easier commutes for those that live in the West and North Shore areas but are employed in the South Shore or vice versa, by avoiding the need to take long winding bus trips.This is doubly beneficial with the massive Charleston Riverside Galleria mall slated to open near Arthur Kill Road and Richmond Valley Road. 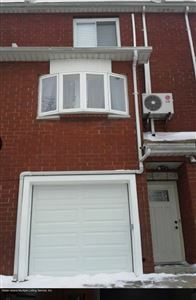 Easy and convenient access to transportation infrastructure, especially if it provides a viable method to reach one’s location of employment has always been a boon to not only the real estate state near the project itself, but through increased borough wide business activity, a positive benefit to overall real estate values across Staten Island. Martino Realty expects that should the West Shore Light Railway project reach completion, Richmond Valley, Charleston, and Rossville should see significant increases in property values should all other factors remain the same. Travis, Bullshead, Graniteville and Elm Park sections of Staten Island can be expected to see a huge surge in prices and sales activity, as these areas rely heavily on local bus services and automobiles for transportation. On a final note, the proposed route would mostly avoid the negative impacts of heavy infrastructure directly adjacent to residential properties, similar to the impact the current Staten Island Railroad creates.